People use email every day, but don’t really understand how it works, assuming it is too technical. The concept of email is quite simple. Just as you don’t have to know how to fix a USPS delivery vehicle to understand how mail gets to your mailbox, you don’t have to understand the geek-speak to know how email gets to its intended destination. Many parallels exist between email and traditional postal mail. The biggest difference is in speed, which is why regular mail is referred to as snail mail. Otherwise, the similarities between email and mail are numerous. A message is composed on a computer by using an email program: a client. The email program combines the text you wrote (the body) with the recipient, subject, date, and time (the header). Your email program (the client) then sends the message off to an email server by using the Simple Message Transfer Protocol, or SMTP. The email server is basically a program running on another computer. For most people, the computer is located at your Internet service provider, or ISP. At the server, the message is dissected and the recipients culled from the message’s To, Cc, and Bcc fields in the header. The SMTP server then finds the host computer for the recipients. For example, if the message is being sent to billg@microsoft.com, the server looks up microsoft.com and sends the message off to that computer. For a few nanoseconds, the message hops around the Internet as it makes the connection to the destination computer. At the destination computer, another SMTP server fetches the message and stuffs it into a mailbox for the intended user. There, it sits and waits until the user logs in to collect mail. But the mailbox on the server isn’t the same thing as the inbox in your PC’s mail program. 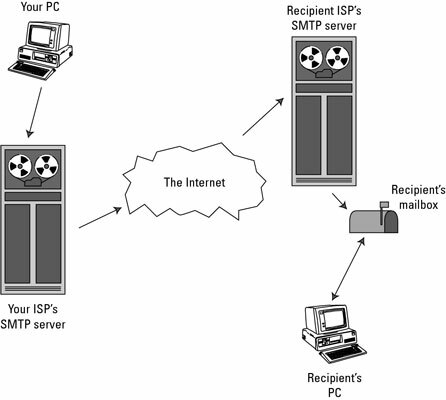 The recipient’s mail program collects new messages from his ISP’s server. The mail program uses the Post Office Protocol (POP) to fetch the message. POP is used instead of SMTP because the email message is no longer being sent on the Internet; it has arrived. All the POP does is fetch the message waiting on the server and transfer it back to the user’s computer and his email program. After the mail messages are on the recipient’s computer, they’re stored in a database. Secretly, all email programs are database programs. After your messages are received, they exist in various mailboxes organized by your email program: Inbox, Deleted Items, and Junk, for example. The email methods described here don’t apply to email systems at large organizations, such as Lotus Notes or Microsoft Exchange. In addition to POP is the Internet Message Access Protocol (IMAP) method of reading email. Unlike POP, IMAP doesn’t delete messages from the user’s mailbox on the server until the user deletes the message. Web-based email programs, such as Gmail and Hotmail, often prefer IMAP. Your email is stored on the ISP’s computer until you pick it up. Unless you retrieve those messages, your mailbox on the ISP’s mail server continues to fill up until it’s so bloated that no more messages can be received. Most ISPs limit the size of your mailbox. Additionally, your account may have size limits on individual messages, which often can’t be larger than 5 or 10 megabytes. Contact your ISP for specifics. When your mailbox gets full, the ISP bounces any new email you might receive. The message is returned to the sending SMTP computer, but the sender may not receive a notice that the message has bounced.